I found a dead bird on the street one day. It was run over by something. I know that because of its flatness, the kind achieved almost exclusively by being run over by something. 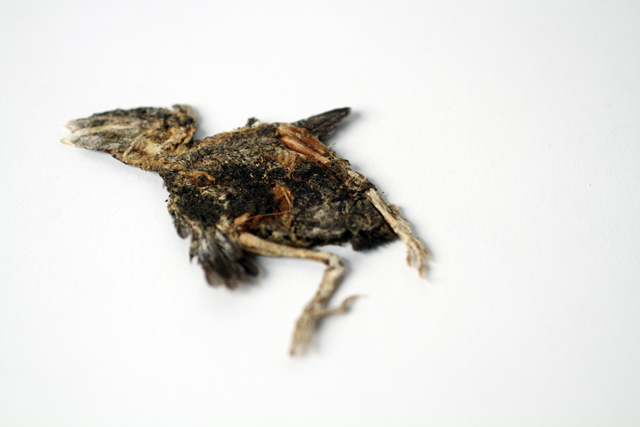 Maybe it was this flatness that made me think of this dead bird as collage material, but in any case, I kept it. I put it in an envelope that I wrote 'DEAD BIRD' on. Many months later I opened that envelope. You know, it is amazing how long a flat dead bird can retain its unpleasant odor.